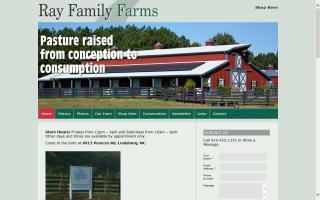 Ray Family Farms specializes in pasture pork, grass fed beef, and free range chickens and eggs. We offer farm fresh eggs and pasture raised meats including goat, rabbit, chicken and duck. In addition, we have potted plants, cut flowers and seasonal produce and herbs from our chemical free gardens. We sell lovely rabbits including Lionheads, English Spots and Mini Rex. We raise free range chickens for eggs and meat. We are breeders of Bourbon Red turkeys as well as Alpine Dairy goats and Katahdin sheep. Our laying flock of heritage chicken breeds is animal welfare approved. We are waiting Certified Naturally Grown recognition. Our vegetables and pecans are organic.